BBQs are awesome. Augmented reality is awesome. Imagine (if you will, nay, can) the awesomeness unleashed by combining the two. Well brace yourself, it’s been done. 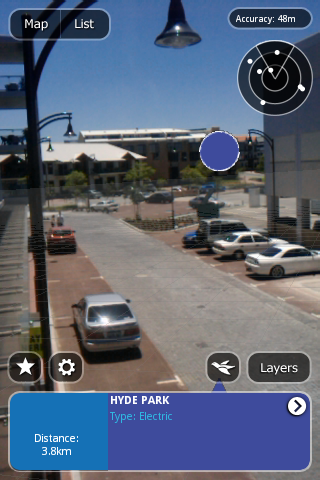 Combining the oh-so-great Meat in a Park API with the augmented reality browser Layar for Android (and yes, iPhone too), I present “the meat in a park layar” (thanks, I know it’s a great name). 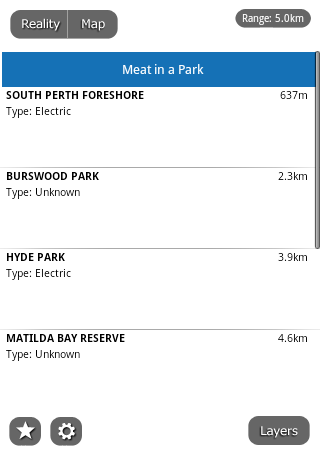 Use it to find a BBQ near you (although the MiaP service only has data for Australia – if this changes then I’ll lift the country restrictions). It’s been approved, so first get Layar from the Android Market or the iPhone App Store and you can find it listed under ‘Eating and Dining’. As always the code is on github. Hey! Nice work! I like it! MiaP could work elsewhere too, just need people to enter BBQ locations. 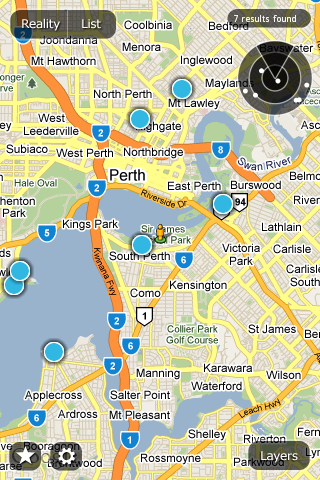 All the location data is from Oz at the moment.